For this month’s Secret Recipe Club I was sent over to Tara’s Multicultural Table to find a dish to replicate. Just as the name suggests, Tara’s blog is brimming with different ethnicities of food. I was intrigued and scoped out some of the delicious recipes before making a beeline over to her breakfast recipes. 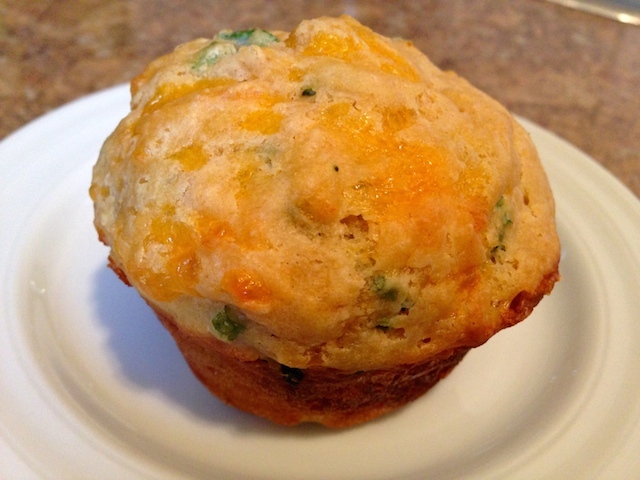 Tara’s recipe for Cheddar Chive Muffins caught my eye. 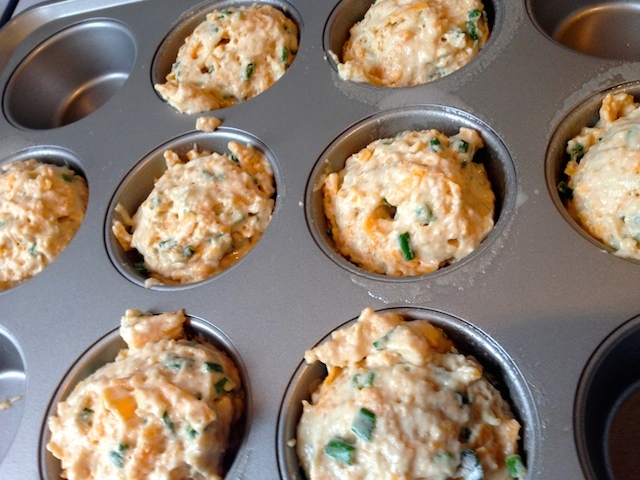 I’m a big fan of muffins but never gave much thought to savory muffins. Packed with cheddar, how could I resist? The muffins came out light and springy. Almost like a biscuit, but muffin shaped. The batch of 8 was quite filling and the perfect quantity for our shorter week. Next time I might have to test the addition of ham or bacon in them. Preheat oven to 375 degrees F. Spray 8 muffin cups with nonstick cooking spray. In a large bowl, combine flour, baking powder and salt. Mix in the cheese and chive. In a small bowl (or large measuring cup, like I did, whisk milk, egg and melted butter. Stir into dry ingredients until just combined. Divide batter among 8 muffin tins (I find a large spring-loaded ice cream scoop does the job well). Bake in preheated oven until golden and toothpick inserted in center comes out clean, 20-25 min. PERFECT! This makes two savory muffins in this month’s reveal day for our group, and they are both more than welcome in my Pinterest board… love a savory muffin! I haven’t has a chance to look at the other reveals yet but now super excited about another savory muffin! A savory muffin for breakfast? GREAT IDEA! Thanks! I love them and skip the sugary baked good guilt. Glad you enjoyed the muffins! I usually like something sweet for breakfast, but try to make savory foods for my husband and son. This is one of the few savory muffins I keep going back to. My husband would love the idea of adding ham or bacon. The recipe was really fantastic. Usually I have to push my husband to eat breakfast. “Remember, there’s muffins on the counter…” but this time he gobbled them right up. Oh wow, the pairing with spicy chilly sounds fantastic! I hope we’re out of the cold for now but something to keep in mind when winter returns. And as fate has it, things come in threes. My third savory muffin recipe I’ve discovered today. These look fantastic. Food fate is always the best kind! Oh those look so tasty!! Great SRC pick this month!! Yumm!! They absolutely are, Rebekah. I highly advise you try! Did someone say cheddar? These look just amazing. And the whole wheat makes them healthy, right??? 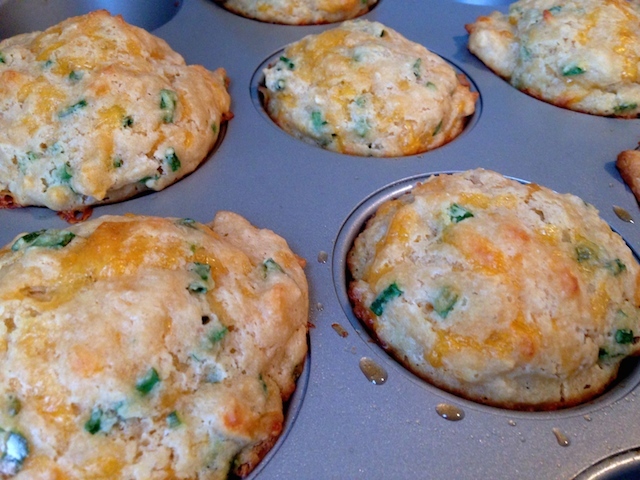 Savoury muffins make a delicious breakfast on the run, especially loaded with cheese. Love the idea of adding some ham or bacon. Corn would be good too, I think. Mmm, good call on the corn. Corn muffin, cheddar, bacon. LOVE!